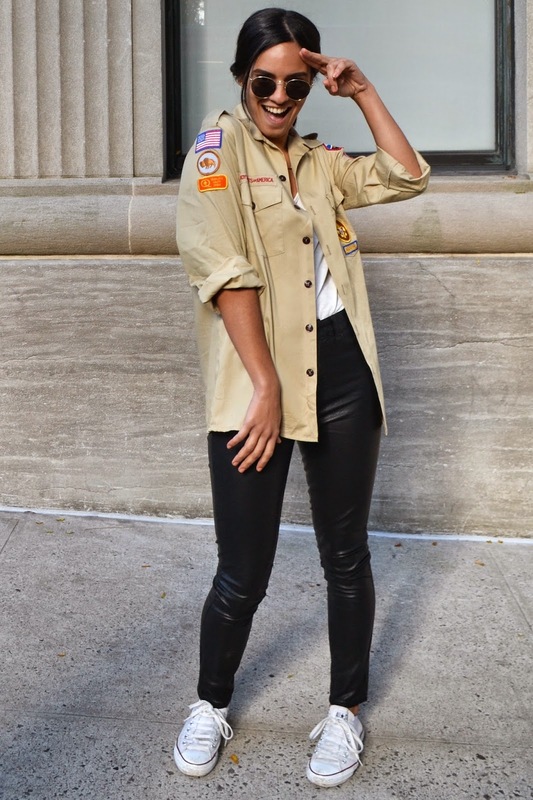 Being that tonight is one of America's biggest nights (if not the biggest) I thought: what better time than now to post this look I based around a Boy Scouts of America shirt I scored at a vintage store. It was obviously a much warmer time when we shot this as I didn't loose a limb when wearing all these light layers to an from work. This is a perfect example of what a 'casual' look means to me: easy layering + comfortable kicks + cool sunnies. Today is one of those Sundays that you wake up and just hit the ground running with all the things you want to do to get a head start on the week. Tonight I'm obvi watching the Super Bowl (more for the ads than for the actual game, hello Advertising major) with mon beau aka le boyfriend. But before that I must clean out my closet which always provides me with major peace of mind and later concentrate on finishing all the props for my Grammy's themed birthday party that I'm hosting in T-7 days! I'm turning 22 and it's super weird to wrap my head around it but so is life. I also want to squeeze brunch somewhere in there but I'm not too sure 24 hours is enough time for all that I have to do. So cheers to a productive and fun Sunday and to getting things done!